My Beauty Life: Feeling A Little Blue? If you have read any of my lipstick posts, you might remember my ongoing desire for blue lipstick. Although that desire is still ongoing and with many new releases, it is getting harder and harder to resist. There was a feature in the most recent edition of The Sunday Times' Style magazine featuring makeup and skincare in blue packaging and it inspired me to think about the blue makeup and skincare products that I have in my life. Blue can look absolutely stunning, or a little too 'old lady' so it was interesting to go through my entire beauty and skincare collection to see what I use blue things I use and what I don't use as much. I bought this back in May in my Boots haul and I am still loving this moisturiser. Now the gel is blue so it does properly count in this post! I love how quickly this sinks into the skin but it still feels like it is deeply hydrating my skin. Even one pump provides a lot of hydration to the skin so you also get your money's worth out of it. Hydrating gel formulas are becoming more popular in drugstore skincare which is great for those with dehydrated skin. I was really excited when EOS first arrived on British shores as I had seen it on many American beauty YouTuber's videos. I do actually have both the blueberry flavour and the mint flavour but unfortately I lost that which is a shame because it is my favourite out of the two. I have since found lip balm formulas that I like a little more so I don't use this as much any more but I would still recommend it. I recieved this in my May Birchbox to try and I'm not entirely sure how I feel about this. I have used the sample pretty much up but I'm not sure if I would buy the full size. It did feel cool and hydrating on the skin which was nice but I don't remember it making a big difference with the longevity of my makeup. I have never been too adventrous with my eye makeup but I do occasionally like to add a pop of colour with eyeliner. I used to occasionally do my winged liner with the royal blue liquid liner from Barry M but now I tend to use this Urban Decay pencil to have the pop of colour in my waterline instead. I have used Urban Decay eyeliners many times and I really like the formula. I find coloured eyeliners can often be less pigmented than black eyeliners but with Urban Decay they are all super pigmented and long-lasting. This is definitely up there with the oldest makeup in my collection. Out of all blue beauty, blue eyeshadow is the most precarious as that is where the old lady line can easily be crossed. I did once use to where this quite a lot when I was first getting into makeup, as my main eyeshadow. I really do not use this very often but if I do, I tend to use it under my lower lashline to add a pop of colour. I don't think The Body Shop make this individual eyeshadows any more which is a shame because I still think the formula is pretty good. Nail polish is definitely where I get the most of out of the shade blue in my beauty life. I am not going to go into every blue nail polish shade because I have already done a post on my nail polish collection where I wrote about all of these. Blue is a shade that can be worn all year round and looks good on both the finger and toes! At the moment, I still into my pastels like I mentioned in my last post so I cannot wait to start wearing my new Rimmel London 60 Seconds nail polish in Pillow Talk - it reminds of my favourite Fiat 500 car! 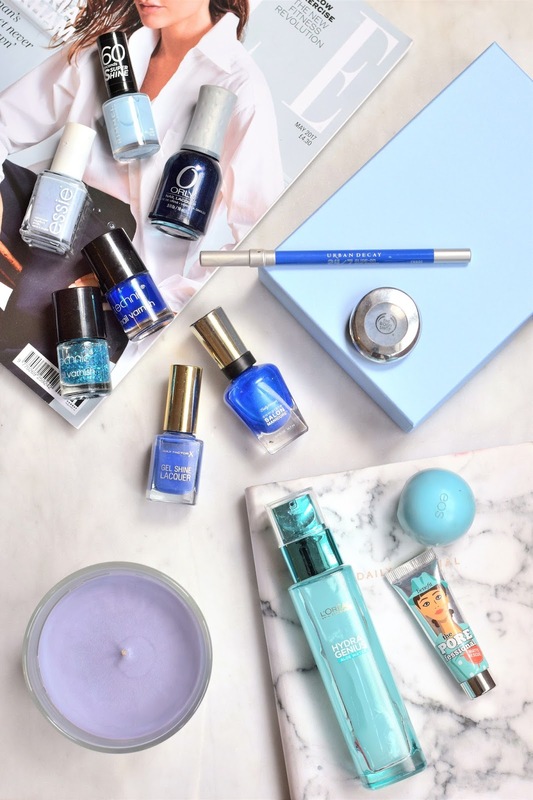 So the use of blue in my beauty life is quite mixed, it is most popular in my skincare and nail polishes which I don't think is too surprising. It might be interesting to see how much other colours are used in my makeup life so if that sounds interesting, please leave a comment below! Hope you enjoyed this post! The Benefit the POREfessional matte rescue gel is my go-to product! I love it so much because I have such oily skin. I find that it works wonders, especially in the Summer! I, too, have been on the hunt for a good blue lipstick but all the ones I find are quite patchy. However, I really want to try the Urban Decay 24/7 Glide-On Eye Pencil.